Concrete flooring gives your space a contemporary feel - but it's a practical choice, too. Here's a guide to what you need to know. Hardwearing and ideal for creating a cutting edge, industrial feel. 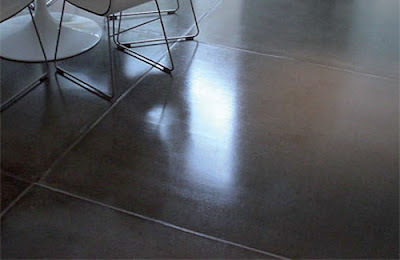 Polished concrete tiles come in every size, whereas a poured concrete floor is installed whole. Both types come in a range of colours and need to be fitted by a professional. Concrete is suitable for underfloor heating. Large, 900x900mm square tiles in natural tones are very popular and can be laid by two people - any bigger than this and you'll need several people to carry them because they're so heavy, which will bump up costs. For a seamless, glossy finish, poured concrete sets in situ and has no joins. Kitchens, bathrooms and living areas all look fabulously contemporary with concrete floors. Use isn't restricted to downstairs rooms as it can be laid as thinly as 5mm. Concrete is also frost-proof and can therefore run right out into the garden. Although porous, it's sealed on installation, making it very low-maintenance and resistant to spills and stains. You're unlikely to get much change from £100 per sq m.